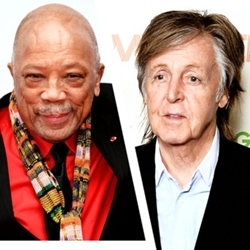 Paul McCartney Responds to Quincy Jones Diss: 'He's Totally Out of His Tree' . Beatles Radio: The Beatles, Solos, Covers, Birthdays, News The Fab 4 and More! He then went on to say that Jones called him personally afterwards to both clear the air and deny ever saying the words. In the interview, McCartney recounted the night Jones called him and said,““I didn’t really say that thing—I don’t know what happened, man. I never said that. You know I love you guys!’ I said, ‘If you had said that, you know what I would have said?